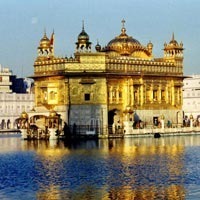 Golden Triangle with Golden Temple (Amritsar) Tour is a special India tour that unfolds unique cultural practices, disparate architectural structures and distinctive history of three prominent religious faiths- Hinduism, Sikhism & Islam. Another attraction of Golden Triangle with Golden Temple (Amritsar) Tour is that it shows you temple of Bahai faith (Lotus Temple) as well. Another remarkable aspect of this tour is that it covers landscapes of India’s capital Delhi, Hindi heartland of Uttar Pradesh (Agra & Fatehpur Sikri), royal Rajasthan (Jaipur) and vitality-oozing Punjab (Amritsar- Golden Temple- Harmandir Sahib Gurudwara). Golden Triangle (Delhi-Agra-Jaipur) & Golden Temple of Amritsar make this tour doubly golden in terms of a vast array of monuments, historical awareness and incredible India experiences. Optima India Tourism representative will be waiting for you at the main exit gate of Terminal 03 of Indira Gandhi International Airport, New Delhi. Warmth of traditional Indian hospitality, inspired by ‘Atithi Devo Bhav’ (guests are like gods), will be felt by you on arrival at Delhi. Representative of Optima India Tourism will accompany you and ensure smooth and speedy check in at Delhi hotel. Have rest in cozy setting. Overnight stay will be in Delhi hotel. In the morning enjoy delicious breakfast at coffee shop in Delhi hotel. After breakfast, you will be introduced with your Delhi tour guide, waiting in the hotel lobby. You will go on a guided tour of Delhi- Old & New- at 8:00 am, beginning with a morning sightseeing trip to Gandhi Memorial at Raj Ghat, Jama Masjid and Chandni Chowk, followed by the drive around Red Fort, India Gate and President's House. In the afternoon, visit Humayun's Tomb, Lotus Temple and Qutub Minar. Explore local market and social life while enjoying rickshaw ride in Chandni Chowk. Overnight stay will be in Delhi hotel. After having delicious breakfast in the morning, proceed for Agra, the erstwhile Mughal capital. Agra is home to three UNESCO World Heritage sites- Taj Mahal, Agra Fort & Fatehpur Sikri. 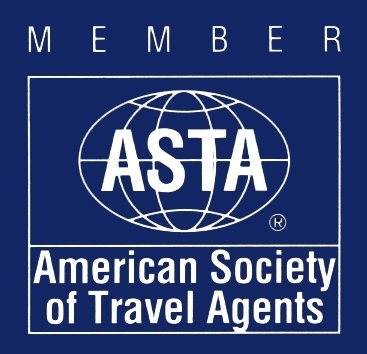 On arrival at Agra, check in at the designated hotel. After having relaxed for some time, move for visiting enchanting Taj Mahal. Taj Mahal is the star attraction of Agra. 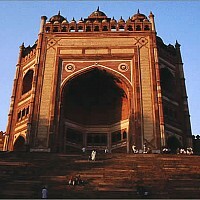 Built by Shahjahan in memory of his beloved wife Arjumand Bano Begum a.k.a. Mumtaj Mahal, Taj Mahal is built of white marble of Makrana. Makrana marble changes colour with the colours of the sun. After visiting Taj Mahal and having sumptuous lunch, move for visiting Agra Fort and Tomb of It-Mad-ud-Daula (Baby Taj). After completing the sightseeing of famous monuments of Agra, you will have enough time to explore local market of Agra which is famous for its marble products, handicrafts and leather articles. Later in the evening, return to Agra hotel for overnight stay. Day 4 Agra- Fatehpur Sikri- Jaipur (250 km/ 05 hrs. 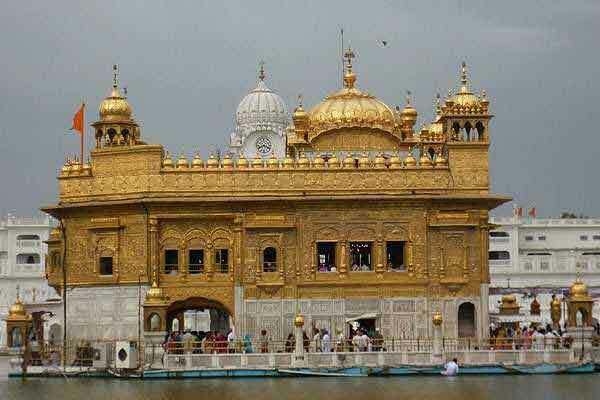 Golden Triangle with Golden Temple (Amritsar) Tour encompasses the destinations that are bejeweled with finest monuments at gigantic scale. Monuments of deserted city of Fatehpur Sikri like Buland Darwaja, Panch Mahal, Jodhabai Palace, Jama Masjid and shrine of Salim Chishti live up to royal finesse and grandeur. The architectural gems of Fatehpur Sikri are masterpieces in sandstone with the stunning elegance of its palaces and courts. 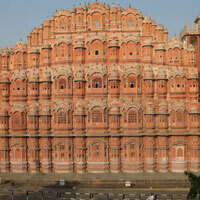 The 5th day of Golden Triangle with Golden Temple (Amritsar) Tour is filled with exotic royal Rajasthan experiences. The day starts with early morning breakfast and your 11 kms drive to Amber. Amber used to be capital of Kachhwaha Rajputs during 1037 AD to 1728 AD. Amber Fort is the prime tourist destination of Jaipur. Ride on caparisoned elephant from the foothill to the main gate of Amber Fort at the hilltop will give you a feel of being 'Maharaja'. 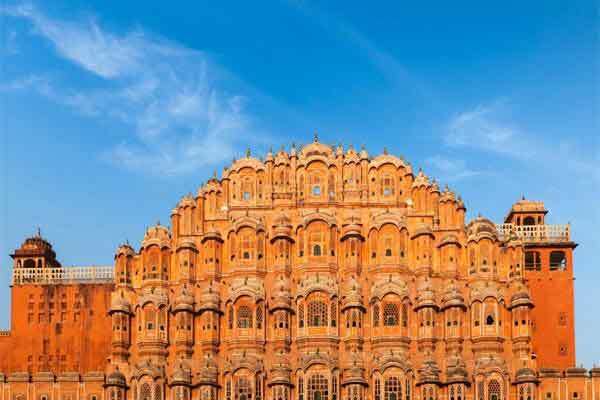 After visiting Amber Fort, proceed on for visiting other wonderful monuments of Jaipur like City Palace (palace of Jaipur royal family), Jantar Mantar (still working solar observatory od medieval era), Hawa Mahal ('Palace of Winds'- a facade for royal ladies) and Birla Temple. This evening of Golden Triangle with Golden Temple (Amritsar) Tour is going to be more special with your visit of Chokhi Dhani, ethnic village resort known for wonderful cultural evening atmosphere. The guests can move around freely and enjoy the evening. After having delicious Rajasthani dinner in Chokhi Dhani, drive back to Jaipur hotel for overnight stay. Allow yourself to relax longer today. Have relaxed breakfast and move for Delhi. On arrival at New Delhi, the capital of India, check in at the Delhi hotel. In the evening, you will be taken to Akshardham Temple to attend a spiritual saga narrated by means of sound, light and water fountains. For those desirous of delving into India's eternal and ethereal spiritual journey, the sound and light show at Akshardham Temple will be a treat to eyes, ears and soul. After visiting Akshardham Temple, return to Delhi hotel for overnight stay. Early in the morning, the tour driver will pick you up from Delhi hotel and take you to New Delhi railway station to board train for Amritsar. Have breakfast in the train. During the train travel, view the panoramic sights of rural landscape of traditional India. Have lunch in the train as well. Reach Amritsar early in the noon. On arrival at Amritsar railway station, you will be taken to the pre-booked Amritsar hotel. Late afternoon, you will be driven to Wagha Border to witness Beating Retreat Parade of Indian and Pakistani Border Security forces. Late in the evening, return to Amritsar hotel for overnight stay. Having taken sumptuous breakfast in the morning, drive to Golden Temple, the holiest shrine of the Sikhs. The Golden Temple of Amritsar is also called Har Mandir Sahib. Sikh temple is called ‘gurudwara’. After visiting Golden Temple during morning hours, drive to Jallianwala Bagh, the park symbolic of British barbarism and Indian martyrdom. Early afternoon, transfer to the railway station to board train for Delhi. On arrival at New Delhi railway station, you will be received by a representative of Optima India Tourism to take you to the pre-booked Delhi hotel for overnight stay. Golden Triangle with Golden Temple (Amritsar) Tour concludes today. You will be ensured a punctual transfer to the International airport to board flight for your onward travel. A few places which attract the masses are Qutub Minar (world's tallest free-standing brick minaret and also a UNESCO World Heritage Site), Red Fort of Delhi (a UNESCO World Heritage Site), Humayun's Tomb (first mature Mughal Tomb built in 1560), Akshardham temple (the largest Hindu temple complex in the world), the Lotus Temple (a Bahai worship place & notable for its flowerlike shape), the India Gate (originally called the All India War Memorial, located astride the Rajpath), President House, Parliament Building etc. Amritsar is capital city of Punjab province of India. The Sikh faith came into being in Punjab. To the Hindus and Sikhs, Amritsar is synonymous with the holiest shrine of Sikhism, the Harmandir Sahib of Golden Temple. It calls to the devotee in all corners of the world. A double- storey marble structure, its dome is covered with gold, as indeed are those of many Sikh temples (gurdwaras) all over the country. This is due to the devotion of the people for whom offering a part of their earnings is very important. Manual labour or 'Karseva' is another very important offering. It may be in the form of sweeping and washing the temple premises, cooking or actually bricklaying and building the Place. Total meals: 11 (Breakfast-08; Lunch-02; Dinner 01). Total night stays: 07 (Delhi-04; Agra-01, Jaipur-02, Amritsar-01). 01 lunch in Samode Palace and 01 lunch & dinner in Shatabdi Express train. Beating Retreat Parade of Indian Border Security Forces & Pakistan’s Pakistan Rangers at Wagha Border of Punjab. Amritsar: Handicraft items embellished with ‘phulkari’, Punjabi jutis (shoes), lacquered woodwork, jewelry, hand-woven carpets, blankets & woolen garments. Amritsar:Amritsari Chhola, Kulcha & Lassi.